Christine Janssen PhD is a clinical professor of entrepreneurship and the director of the Entrepreneurship Program at the Gabelli School of Business at Fordham University. Her doctoral dissertation was on the topic of entrepreneurship education. Even a cursory look at recent business innovations leads to the conclusion that you do not necessarily need a degree to be an entrepreneur. Those who seek to be the next generation of entrepreneurs, however, do need an education. But what form should that education take? A recent article in the Wall Street Journal touched on the importance of networking and support systems while downplaying the importance of choice of school and grades in college. Where you go to school is important. Aspiring entrepreneurs should choose a school that possesses more than a longstanding reputation and brand recognition. What can really differentiate one’s experience and outcome are resources, mentors, and access to non-traditional learning experiences that the school can offer. Students should select a school that is dedicated to supporting entrepreneurs and has built a dynamic ecosystem to do so. Institutions such as Babson College and Indiana University will open countless doors for students by providing the necessary connections and opportunities beyond the classroom to shape our future change agents. The key variable here is relevancy. The educational experience must be internalized and relevant enough to impart long-term impact and inspiration on students. 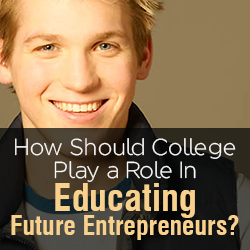 So how can colleges and universities best prepare future entrepreneurs? Colleges must mold students to think entrepreneurially – whether they are in a business school or a liberal arts program. This mindset and the accompanying skillset can and SHOULD be taught to all college students. Entrepreneurs evolve from any given major, but I would also propose that students should be able to customize their educational experience. While there are certain subjects that all aspiring entrepreneurs should master (accounting, finance, communications, management and just about anything related to technology), college can no longer be a one-size-fits-all proposition. Do not ignore grades. A student’s grades don’t necessarily reflect what they have learned or if what was learned is relevant, but a healthy transcript still is a reflection of a student’s effort and commitment. I would certainly select someone with a 4.0 grade point average over a 2.8 GPA any day to join my startup. Integrate the real world into entrepreneurship education. Extracurricular programs at universities such as conferences, clubs, speaker series, incubators and accelerators are great, but there are exponentially more activities going on beyond the walls of academe. Lean Startup Machine, 3 Day Startup, Y Combinator, General Assembly, WeWork, and the Startup Institute come to mind. Such practical hands-on experience and networking opportunities are priceless because they bring the entire learning process alive. Network. In every core class in my entrepreneurship program, students are REQUIRED to attend professional networking events – and they may not be university-sponsored events or events on campus. That’s too easy. My job is to expose them to the real world and begin building a toolbox of skills and resources so when they complete my program they will have dozens of relationships (and potential mentors) established to help them build out their careers – whether launching a new venture, working at a startup, or being the innovation catalyst at a larger organization. Pushing students out of their comfort zones is a one small step for students, one giant leap for new business creation. Incubate entrepreneurial efforts at the university. The jury may be out on this one, but I think college is a great place to launch your first venture. Students are in a safe, supportive environment with loads of resources and little to lose. Besides, experienced entrepreneurs know the dirty little secret that most everyone’s first venture bombs. You might as well do that while you’re at university and chalk it up to experiential learning. At the end of the day, there is a role for academic institutions to play in entrepreneurship. They must utilize forward thinking, out-of-the-box teaching strategies and opportunities to prepare the next generation of problem solvers.